FREE SHUTTLES TO KITE FEST FROM GOLDEN GATE FIELDS! Buchanan St. (north) access route. the Clevland exit is labled only as "Albany Exit." the Buchanan St. exit is from the freeway's left lane. AC Transit's 51B Bus serves a route that includes Rockridge Bart, Downtown Berkeley Bart and West Berkeley. The 51B weekend schedule every 25-30 minutes. Many Kite Fest veterans know that one of the easiest ways to get to the even it park in West Berkekely and walk or bike to the Kite Fest via the pedestrian bridge. Richmond Spokes will again be providing Valet Bike Parking at the Kite Fest. Though not manditory a small donation to Richmond Spokes is always appreciated. 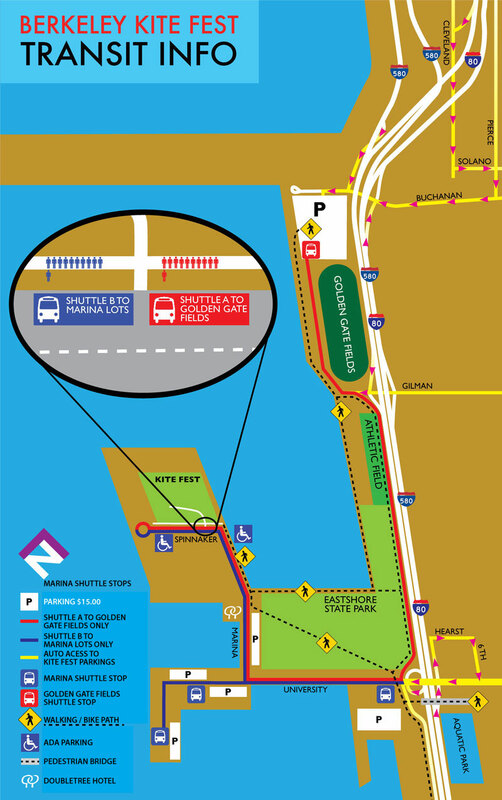 Limited parking is available within the Berkeley Marina and a free shuttle will serve all lots within the Marina. Parking in the Marina is managed by the Berkeley Rotary Club and your $15 parking fee goes to support valuable community programs. Please be advised that traffic in the area of the Berkeley Marina may be subject to heavy delays between 10 am and 7 pm during the Annual Berkeley Kite Festival. Please also be advised that per police and fire safety regulations, parking will be completely prohibited along either sides of major roads in the Marina including University Ave., Marina Blvd, and Spinnaker Way. Vehicle access will also be significantly restricted on Marina Blvd. and Spinnaker Way. The City will exercise ZERO TOLERANCE for cars parked illegally or on unpaved surfaces. These vehicles damage our land and wildlife. Illegally parked cars will be cited and subject to tow at the owner’s expense. Save money and stress by choosing one of the following parking options listed below. Don’t forget - entrance to the Kite Festival itself is free! Kite Festival Attendees are asked to consider free parking east of I-80 and walking/biking across our new Bike/Pedestrian Bridge. Enjoy a scenic view of the SF Bay while walking to our great kite display and festival.